Glass table tops are pretty much the best investment one can make when it comes to protecting furniture. Having people wait until after an accident has permanently damaged the finished wood is what we are seeing everyday. Protect your furniture before accidents. We offer a wide variety of glass table tops ranging from 3/16” to 3/4" think glass. 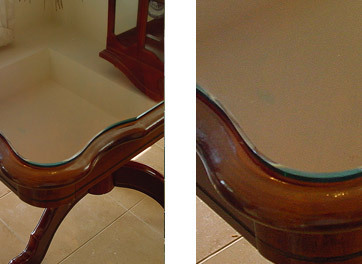 With a large variety of custom edge works and glass choices, no furniture is left unprotected. Due to the demand, after years of research and testing, we will soon be providing scratch resistant glass for those who demand the best. Copyright © 2009. Super Glass. All rights reserved.